This Luxury and highly sought after style unit is located in the very exclusive Diamante Del Sol 24 hour gated community. Overlooking the deep blue Pacific Ocean it features one of the most breathtaking views you can possibly dream of and it is so close to the beach you almost can touch the sand. Each bedroom has a private bathroom with another half bath for guests. Great income producing possibility as vacation rental that welcomes friends and families. 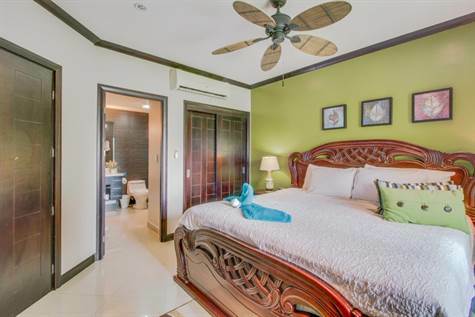 Diamante Del Sol is located right in the center of Jaco Beach and is a block from fantastic restaurants, bars, shopping, surfing, and nightlife. The pool is large and inviting to all guests and overlooks the beautiful beach and ocean. This condo comes fully furnished with higher end furniture. The terrace is huge and overlooks the beach and pool which makes it perfect for BBQ on the grill while watching the sunset. This is an awesome deal! Don't miss this opportunity! A shared pool at your disposal, a cool drink in your hand, and a view of the sea with the nearby beach unfolding below you - what more could you ask for from Costa Rica? Enjoy the best in both tropical beauty and modern comforts with this oceanfront condo. Your new beachside home for four boasts a gorgeous view of the swaying palms, soft sands, and gentle surf right from your private balcony! Just downstairs are the azure waters of the shared pool. You're right near the downtown of Jacó, giving you easy access to bars, restaurants, shopping, and more! Use the WiFi to find your favorites. Modern furnishings and the occasional decorative touch give this home an elegant yet welcoming atmosphere. You can admire it all from the living room, where you're just a few steps away from the balcony's fresh air! Sit back and relax in the plush chairs and sofa, and take in some entertainment on the flatscreen cable TV. There's even a DVD player for your favorite movies! Stainless steel appliances and ample shining countertops make the kitchen a great place for cooking! You have plenty of options for taking in your food, from the breakfast bar for three and adjacent table for four to the outdoor accommodations on the balcony. Just load the dishwasher when it's time for cleanup. With two bedrooms and two and a half baths, up to 4 guests can stay in comfort. Each bedroom has an en suite bath.